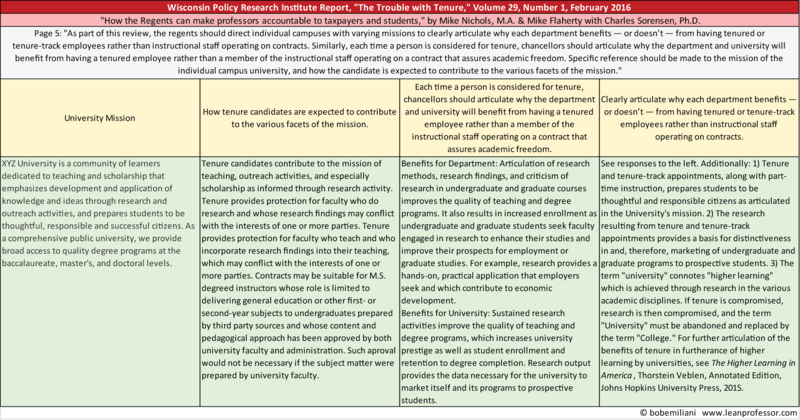 Why is tenure a necessary aspect of higher education and of higher learning? Imagine if a faculty member at a university were to undertake a carefully constructed research project whose data indicated that the above recommendation was the result of various biases, and that, as a result, the report and its recommendations were unreliable for use in executive decision-making. And, what if the authors of the report making said recommendation judged the research to be a personal attack and which damaged their credibility, rather than a dispassionate research project in search of the simple truth? They could complain to the university president and demand that the professor be fired. In the absence of tenure, the professor could be dismissed as a result of their research. The practical consequence is that the simple truth behind the important question of how professors could be made accountable to taxpayers and students would be undiscovered, and would instead remain within the realm of subjective opinion informed by potentially faulty political (or other) ideology. Well-designed research might instead reveal uncomfortable truths regarding administrative labor costs, the cost of NCAA athletic programs, and other costly dissipations that do not contribute to the university’s mission, and which therefore indicate that the principal accountability to taxpayers and students lies elsewhere. Tenure, therefore, might be much less trouble than is imagined. It might also reveal that perceived need for universities to become more flexible, nimble and responsive is not actually necessary.